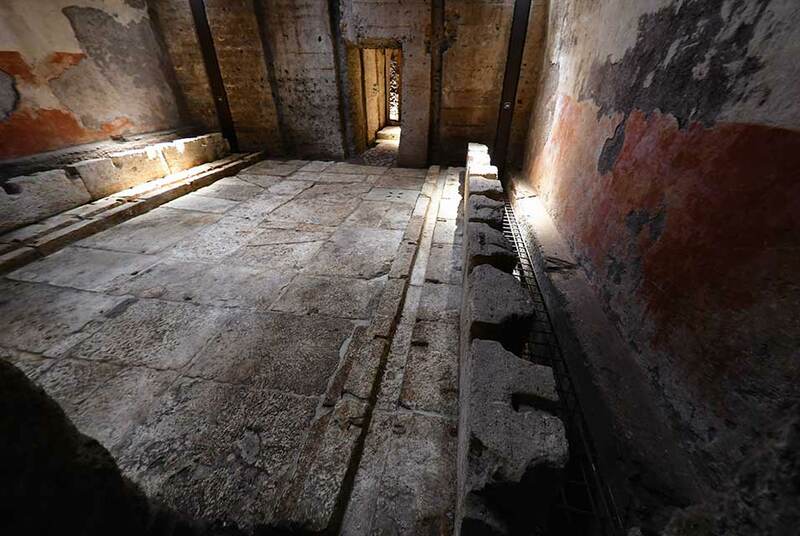 This picture taken on April 12, 2019 shows an interior view of latrines of the Domus Transitoria, Roman Emperor Nero's first palace, destroyed in the Great Fire of Rome in 64 AD. The Domus Transitoria was replaced by his Domus Aurea (or Golden House). Alberto PIZZOLI / AFP. ROME (AFP).- Razed to the ground by the Great Fire of Rome, Emperor Nero's original palace opened to the public for the first time on Friday after a painstaking 10-year restoration. The ruins of the sumptuous "Domus Transitoria", once decorated with gold leaf, precious stones and mother of pearl, lie next to a well-preserved 50-seat latrine used communally by builders and slaves. Nero claimed to be a descendant of Aeneas -- a legendary hero of the Trojan War, as Homer tells it in the Iliad -- and was a big fan of Trojan heroics. He had the ceilings of his palace adorned with mythical scenes from the Trojan War, some of which are now on display at the Palatine Museum next door. But the emperor, said to have committed suicide as his enemies closed in on him, did not have long to enjoy the "Domus Transitoria" (Transit House), so-called because it allowed him to "transitare" (walk through) the area from the Palatine to the Esquiline hills. On a summer's night in July 64 A.D. a fire broke out in Rome that would rage for nine days and reduce much of the Eternal City to rubble. The ruins of the palace show traces of that immense blaze. One of the best-preserved parts of the complex are the toilets, most likely used by construction workers for the Domus Aurea. The walls are painted red to hide the dirt, and a channel running along the ground once carried water that would have wetted sponges on sticks used to clean nether regions. The speed with which Nero embarked on the new project fuelled rumours that the fire had been started on his orders. Legend has it that the man who became emperor at just 16 played his lyre -- or fiddle -- on a hill while Rome burned below him. According to Tacitus, the senator and historian who lived at the time of the fire, Nero blamed the devastation on the Christian community. Those convicted were torn to pieces by wild dogs, nailed to crosses or burnt at the stake to light the city at night. The ruins can be visited Fridays to Monday by small groups of 12 at a time.